The new decrees from the transitional military leaders are seen as a response to attacks on Coptic Christians last week. 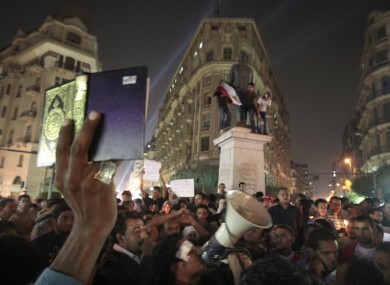 An Egyptian lifts the Muslim holy book, the Quran, as others light candles at Talat Harb square in downtown Cairo to mourn last week's attacks. EGYPT’S MILITARY RULERS have issued a decree prohibiting all forms of discrimination, including on the basis of religion – bowing to a longtime demand from protestors. Anyone found guilty of breaking the new rules may face a penalty of three months in prison, and a fine of up to E£100,000 (around €12,200). The announcement comes a week after 26 people were killed in clashes involving minority Coptic Christian protesters, the military and others. That bloodshed occurred when thousands of Christians rallied at the TV building, to protest an attack on a church in southern Aswan province. The violence marked the worst bloodshed since Hosni Mubarak was ousted from power in February. Christians, who represent about 10 percent of Egypt’s population of 85 million, say they are treated like second-class citizens and that repeated attacks on them go unpunished. Attacks on churches by Muslim mobs led by ultraconservative Salafis have increased in recent months. Hafez Abou Saada, head of the Egyptian Human Rights Organisation, described the decree as a limited but positive symbolic step. “I am not very optimistic that the current government will be able to protect the rights of its citizens and implement this law in the face of growing popular support of religious extremist groups,” he added. Email “Egypt's military rulers ban all forms of discrimination”. Feedback on “Egypt's military rulers ban all forms of discrimination”.